This workshop is now full. If you are interested in participating in a future workshop, please contact Sharon Burdette. Registration is now open for a one-day workshop that will help private landowners learn more about creating and maintaining a proper road, knowledge that can save them money and help keep sediment out of local streams. The “Low-Volume Private-Access Road Construction and Maintenance” workshop will be held Tuesday, September 20, 2016 from 8:00 a.m. – 4:00 p.m. at the Coweeta Hydrologic Laboratory in Otto NC. Forestland owners, farmland owners, homeowners, and homeowner association representatives are invited to register. 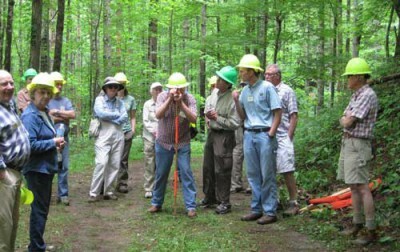 Mainspring Conservation Trust is sponsoring the event in partnership with the U.S. Forest Service Coweeta Hydrologic Laboratory. Funding for the workshop is from the North Carolina Nonpoint Source 319 Grant Program. Poorly constructed and maintained private access roads are a significant source of sediment to our streams in the Southern Appalachian mountains. Proper road construction and maintenance is beneficial for the landowner and the environment, reducing long-term maintenance costs and keeping soil on site and out of our waterways. Topics covered will include planning, layout, and construction of new roads, and maintenance and reconstruction of existing roads. The workshop will be led by Dr. Lloyd Swift, retired researcher from Coweeta, two professional engineers, Ed Haight and Philip Moore, and an experienced local contractor, Lewis Penland. The all-day workshop will include morning classroom and afternoon field sessions. Landowners will leave the workshop with a working knowledge of proven methods for road construction and maintenance, enabling them to converse effectively with road and grading contractors. Representatives from agencies such as Macon Soil & Water Conservation District, NC Forest Service, and USDA Natural Resources Conservation Service will be on hand to provide information on resources and programs available to landowners. Registration is limited to 30 landowners. Rain date is September 27. Cost is $30 per person and includes lunch. Register online here.